James Corden hosts Paul McCartney in Carpool Karaoke. When he was in London two years ago, Corden took Adele on a karaoke car ride, and their spontaneous singalong and conversation has been viewed on YouTube — as of this week — almost 182 million times. Few things on TV or the Internet can generate as much pure joy as a solid Carpool Karaoke segment. But even by those standards, a new one showcasing Sir Paul McCartney stands above all others. In only a few days, it's been viewed on YouTube more than 14 million times — and with very good reason. Not only does it have all the happiness and goofiness you expect Corden to deliver, but this McCartney karaoke is also unexpectedly tender, touching and meaningful. Most Carpool Karaoke segments stay in the car and on the road, but Corden takes McCartney to his hometown of Liverpool and on a trip down memory lane — or, in this case, down Penny Lane. And while Corden drives down that famous street, McCartney's Beatles song of the same name plays on the car stereo, and the two men happily sing along. McCartney enjoys himself so much that he plays tour guide during the song's instrumental breaks — and ends his patter with the expert timing of a veteran deejay, stopping just before the lyrics resume. The mood switches when Corden asks McCartney about the inspirational positivity of so many of his songs. McCartney tells the story of being visited in a dream by his late mother, who advised him that things would be all right, and to let it be. McCartney wrote the song "Let It Be" as a result, and as he and Corden finished singing along to it in the car, Corden was wiping away tears. 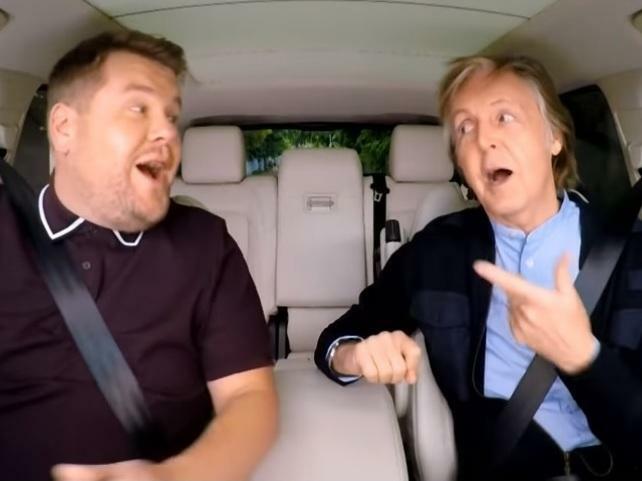 In the car, McCartney also sings a few verses from the first song he ever wrote, then teams with Corden for an energetic duet of "Come On To Me," a new song from McCartney's forthcoming album, Egypt Station. And, of course, since they were driving in Liverpool, they also sang along to "Drive My Car" — with Corden providing perfectly timed car-horn blasts. All that would have been enough for a Carpool Karaoke segment, but this nearly 24-minute piece was just getting started. Using "Penny Lane" as a jumping-off point, Corden took McCartney to old places from his childhood, including a barber shop, a florist and even his childhood home, which is now a tourist attraction run by the National Trust. McCartney stepped inside for the first time since he moved away, and gave Corden, and us, a time-travel visit inside his home — including his memories of the bathroom, where he sat and strummed guitar and sang as a kid, because of the echo from the bathroom tiles. And finally, McCartney and Corden descend on a local Liverpool pub for a surprise appearance. On cue — and the cue was the opening chord of "A Hard Day's Night" — the curtain opens, and McCartney and his band stun the unsuspecting pub patrons with a five-song set. It was like the Beatles on the rooftop in Let It Be -- an unexpected, unbilled, amazing moment of musical history. The Paul McCartney Carpool Karaoke ranks, right now, as my favorite TV moment of the year. And on behalf of Corden, McCartney and the band — with a nod to that famous rooftop concert — I'd like to say they all passed the audition. Fifty-four years after appearing on The Ed Sullivan Show, Paul McCartney is still making exciting, unforgettable television. This is FRESH AIR. Last Thursday, to conclude a week of shows emanating from London, "The Late Late Show With James Corden" presented a new episode of the show's most popular recurring feature, "Carpool Karaoke," in which Corden drives around a guest as they sing along to songs from the car stereo. Last Thursday's guest and what Corden tweeted was quite possibly the best "Carpool Karaoke" we've done so far was Paul McCartney. And our TV critic David Bianculli says there's no possibly about it. To David, it is the best. DAVID BIANCULLI, BYLINE: By now, James Corden has set a very high standard with his "Carpool Karaoke" TV pieces. Only a million or two viewers watch his late-night CBS show when it's broadcast, but YouTube and other social media sites extend Corden's reach phenomenally. When he was in London two years ago, he took Adele on a karaoke car ride, and their spontaneous sing-along and conversation has been viewed on YouTube as of this week almost 182 million times. Few things on TV or the Internet can generate as much pure joy as a solid "Carpool Karaoke" segment. But even by those standards the new one showcasing Sir Paul McCartney stands above all others. In only a few days, it's been viewed on YouTube more than 14 million times and with very good reason. Not only does it have all the happiness and goofiness you expect Corden to deliver, but this McCartney karaoke is unexpectedly tender, touching and meaningful as well. Most "Carpool Karaoke" segments stay in the car and on the road. But Corden takes McCartney to his hometown of Liverpool and a trip down memory lane - or in this case down Penny Lane. And while Corden drives down that famous street, McCartney's Beatles song of the same name plays on the car stereo, and the two men happily sing along. McCartney enjoys himself so much that he plays tour guide during the song's instrumental breaks and ends his patter with the expert timing of a veteran DJ stopping just before the lyrics resume. BIANCULLI: In the car, McCartney also sings a few verses from the first song he ever wrote, then teams with Corden for an energetic duet of "Come On To Me," a new song from McCartney's forthcoming album "Egypt Station." And, of course, since they were driving in Liverpool, they also sang along to "Drive My Car," with Corden providing perfectly timed car horn blasts. All that would have been enough for a "Carpool Karaoke" segment. But this nearly 24-minute piece was just getting started. Using "Penny Lane" as a jumping-off point, Corden took McCartney to old places from his childhood - a barbershop, a florist, even his childhood home, which is now a tourist attraction run by the National Trust. McCartney stepped inside for the first time since he moved away and gave Corden and us a time travel visit inside his home, including his memories of the bathroom, where he sat and strummed guitar and sang as a kid because of the echo from the bathroom tiles. BIANCULLI: And finally, McCartney and Corden descend on a local Liverpool pub for a surprise appearance. On cue - and the cue was the opening chord of "A Hard Day's Night" - the curtain opens, and McCartney and his band stunned the unsuspecting pub patrons with a five-song set. It was like the Beatles on the rooftop in "Let It Be," an unexpected, unbilled, amazing moment of musical history. Then McCartney invited Corden to join them for the final number, which he did, on "Hey Jude." MCCARTNEY AND CORDEN: (Singing) Hey, Jude, don't be afraid. You were made to go out and get her. The minute you let her under your skin, then you'll begin to make it better, better, better, better, better, better. Come on. Na na na na na na na, na na na na, hey, Jude. BIANCULLI: The Paul McCartney "Carpool Karaoke" ranks right now as my favorite TV moment of the year. And on behalf of Corden, McCartney and the band, with a nod to that famous rooftop concert, I'd like to say they all passed the audition. Fifty-four years after appearing on "The Ed Sullivan Show," Paul McCartney is still making exciting, unforgettable television. GROSS: David Bianculli is editor of the website TV Worth Watching and author of the book "The Platinum Age Of Television: From I Love Lucy To The Walking Dead, How Tv Became Terrific." Tomorrow on FRESH AIR, we'll talk about why so many people in the middle class are having a hard time staying middle class. My guest will be journalist Alissa Quart, author of the new book "Squeezed." And we'll hear from Frank Newsome, who sings a cappella hymns in a style that's one of the oldest American music traditions. He's a former Virginia coal miner who now has black lung disease. I hope you'll join us. MCCARTNEY AND CORDEN: (Singing) If you come on to me, then I'll come to you. If you come on to me, then I'll come on to you. Yes, I will. Yes, I will. Yes, I will.